Talking Oysters Professor Stan Allen (R) talks oysters with Virginia Senator Mark Warner during a visit to the Aquaculture Genetics and Breeding Technology Center at VIMS. Photo by David Malmquist. Chancellor ABC Director Stan Allen (L) describes the oyster life cycle to W&M Chancellor Sandra Day O'Connor during her April 2007 visit to VIMS. Looking on are VIMS Council member Travis Massey and VIMS Dean and Director John Wells. Photo by Stephen Salpukas/William & Mary. VA Delegates ABC Director Stan Allen (2nd from R) describes VIMS' role in oyster aquaculture to members of the Virginia House of Delegates’ Chesapeake Subcommittee during their visit to VIMS in August 2009. Researchers in the VIMS oyster hatchery are working to breed disease-resistant oyster strains for use in the Bay. Photo by David Malmquist. President Reveley ABC Director Stan Allen (L) describes algal culture to W&M President Taylor Reveley during a July 2009 visit to VIMS. Photo by David Malmquist. VEDA Visit Members of the Virginia Economic Developers Association (VEDA) toured VIMS in March 2008 as part of their annual spring conference in Williamsburg. The tour highlighted VIMS research activities with potential economic benefits to the Commonwealth. Here, ABC Director Stan Allen (L), describes efforts to advance oyster aquaculture in Chesapeake Bay. Photo by David Malmquist. 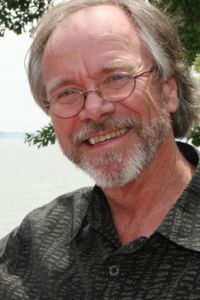 Professor Stan Allen of the Virginia Institute of Marine Science joined exalted company in late October when he received an Inventor of the Year Award from the New Jersey Inventors Hall of Fame, whose inaugural class includes Thomas Edison and Albert Einstein. Allen, who directs the Aquaculture Genetics and Breeding Technology Center (ABC) at VIMS, was honored with colleague Ximing Guo for their “product by process” patent for oysters with two extra sets of chromosomes. The pair accomplished their breakthrough in 1994 while at Rutgers University, where Guo continues to work. Allen arrived at VIMS in 1997 as ABC’s first director. Allen and Guo’s invention—plus subsequent enhancements at VIMS and Rutgers—has revolutionized oyster aquaculture worldwide, including its recent rapid growth in lower Chesapeake Bay. More than 90 per cent of Virginia’s farmed oysters result from the production method they created. The ABC hatchery at VIMS currently operates the most extensive breeding program for oysters in the U.S., and arguably the largest in the world. Allen and Guo’s oysters are called “tetraploids” because they contain four chromosomes in each cell nucleus rather than the pair of chromosomes found in regular “diploid” oysters. 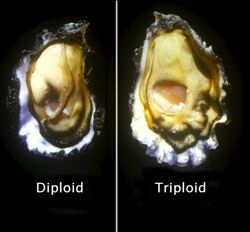 Breeding tetraploids with diploids in turn creates “triploid” oysters, whose three sets of chromosomes renders them incapable of reproduction. The same general process is used to create seedless fruit. Because triploid oysters devote no energy to reproduction, they grow to market size more quickly than fertile oysters, produce more meat, and can be harvested during summertime when spawning-associated decreases in meat quality normally puts the harvest of wild oysters off limits. The rapid growth of triploid oysters is particularly important in Chesapeake Bay, where a pair of oyster diseases—MSX and Dermo—has devastated wild stocks. Because of their faster growth, triploid oysters reach market size in about 18 months, 6 to 12 months before their wild brethren and importantly before the usual age of disease-associated mortality. The triploids have also been found to be more tolerant to the two diseases, for reasons still unknown. Not one to rest on his laurels, Allen and his colleagues in ABC’s oyster hatchery at VIMS continue to conduct basic and applied research on all aspects of oyster biology and domestication, including studies of the process by which tetraploids are produced and selection for even better disease tolerance in the triploid oysters that now dominate aquaculture in Virginia. Those operations continue to grow, with the latest figures from VIMS’ annual report on the economics of shellfish aquaculture showing a 20% increase between 2011 and 2012 in the number of farmed oysters sold by Virginia growers—from 23.3 to 28.1 million—with 2012 sales valued at $9.5 million. Total direct employment associated with sales of farmed oysters in 2012 reached 70 full-time and 106 part-time jobs in the Commonwealth.